Located in the High Sierras near Yosemite National Park is one of the nation's most exclusive vacation resorts. 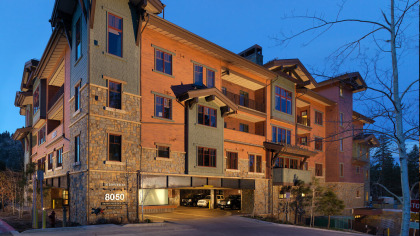 The 8050 Mammoth Private Residence Club is a mountain resort with all the amenities you can imagine. 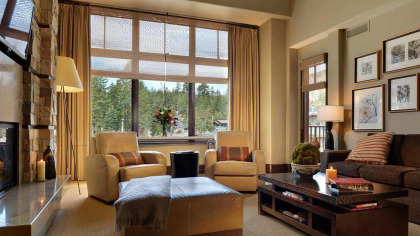 These Mammoth Lakes timeshare resales are luxurious guest suites sold on a fractional basis. Located in the High Sierras near Yosemite National Park is one of the nation's most exclusive vacation resorts. 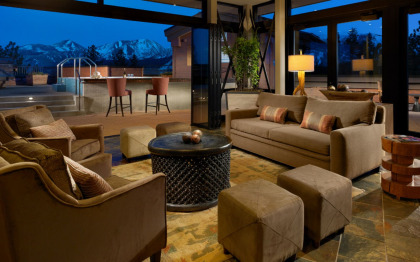 The 8050 Mammoth Private Residence Club is a mountain resort with all the amenities you can imagine. These Mammoth Lakes timeshare resales are luxurious guest suites sold on a fractional basis. The units come in varying sizes from spacious one-bedroom suites suitable for couples to three-bedroom units that accommodate large families. 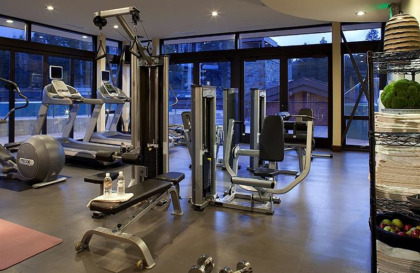 The amenities at 8050 Mammoth are first-class, and guests who own a timeshare suite have unlimited access to the club location's spa, on-site restaurant, and concierge services. You'll indeed be pampered when you stay here. Grocery delivery, personal chef services, and recreational equipment storage are included when your reservation includes the mark of club membership. Of course, the mountains beckon year-round, with fabulous hiking, skiing, and snowboarding just a few miles away. Every suite, whether one-bedroom or larger, features such niceties as leather-appointed dining chairs, large-screen plasma TVs, ceiling chandeliers, onyx and glass-tile bathtubs, heated bathroom floors, and Tibetan rugs. Each timeshare has a separate kitchen and minibar area, and the living rooms are furnished with soft-upholstered easy chairs and sofas. The TVs are connected to an entertainment system, and the living rooms have spacious windows with mountain views. The larger units have similar master bedroom layouts but also have separate guest rooms that are furnished with a queen or double bed. These units also have multiple bath areas. All units have complimentary Internet access. Owners can reserve ahead for as many as six weeks, separated into fractions throughout the calendar year. Pre-arrival check-in and order-ahead grocery delivery are available. Club members have access to the on-site bars and great rooms, and they also have punched tickets in the wintertime to the nearby Mammoth Mountain ski area. Desk service is 24-hour, and all guests are assigned personal underground parking spaces. The rooftop lounge and spa is a great place to go and unwind after a day exploring the High Sierras. There's also a game room, and the on-site Toomey's Restaurant offers everything from steaks and seafood to pasta and meat salads. The 8050 Mammoth Private Residence Club is truly a home-away-from-home, and with one of these Mammoth Lakes timeshare resales, your second home is surrounded by the finest scenery in the entire world. Contact 8050 Mammoth Private Residence Club Specialist Today!